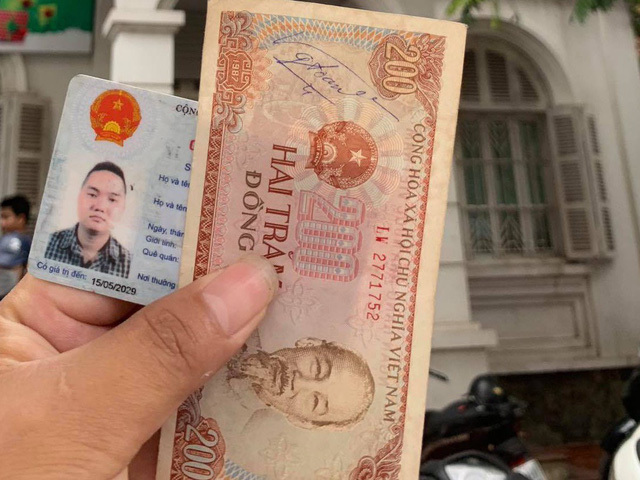 Phan Thanh Tung (unseen) holds a VND200 banknote and his national ID card after paying his overdue debt in this photo uploaded to the man’s Facebook profile. A man in Vietnam was stunned to receive an e-mail from his former lender asking him to pay VND196 (US$0.0085) in credit card debt and a late payment fine of VND5 ($0.00022). Phan Thanh Tung, a Hanoi resident, said he opened a credit card at a local lender years ago during a promotional event, but never got round to using it. About two years after opening the credit card, Tung received a call from the bank asking him to pay more than VND1 million ($43) in outstanding maintenance fees. He complied and transferred his payment to the bank’s account, thinking it was the end of the trouble. However, in early April, Tung received an e-mail from a debt collection agency informing him that he still had VND196 in outstanding credit card debt that had been overdue for 968 days as of March 31. The agency requested that Tung finish paying off the debt as soon as possible “to avoid unnecessary inconvenience”. In addition to the debt, Tung was asked to pay a fine of VND5 for late payment. Tung said he had to scramble for two VND200 banknotes to make the payment in person, as the amount was too small to be transferred electronically. The smallest denomination of the Vietnamese currency is VND100, although banknotes smaller than VND500 are rarely seen in circulation. As clerks couldn’t find any smaller notes to give Tung his change, they agreed to reduce his debt and fine to VND200 in total. Tung has recalled the bizarre debt paying story on a Facebook group. A bank representative told Tuoi Tre (Youth) newspaper the case of Tung is rare and unwanted. In reality, such small debts are usually covered by the lender using its own funds, as the costs to have these debts collected are much larger than the debt itself. There must have been a mistake at some point that led Tung’s files to be transferred to the bank’s debt collection department, the representative said.